Play, dine, shop and stay. From Key West to Miami and Fort Lauderdale up through The Palm Beaches, Florida's Southeast coast offers an abundance of entertaining things to do. Begin your day with breakfast in the outdoor courtyard of Blue Heaven. Then wander the Old Town district enjoying colorful Victorian architecture. Snap a "mandatory selfie" at the Southernmost Point in the continental USA. Visit the Ernest Hemingway Home & Museum and the Butterfly & Nature Conservatory. Grab lunch in the Historic Seaport before embarking on a reef snorkeling excursion. Catch a beautiful sunset and the action at Mallory Square. Dine at an Old Town restaurant and sample the nightlife on Duval Street. Start your morning with a tour of the beautiful historic Bonnet House Museum & Gardens or snorkel or dive to explore 69 miles of natural coral reef just offshore. Board a water taxi and cruise through the 300+ miles of Intracoastal waterways while viewing some of the most incredible mansions and homes. Revel in a unique dock-and-dine experience at one of many waterfront restaurants before taking in a show at the Broward Center for the Performing Arts. End with a stroll along picturesque Las Olas Boulevard. Relax poolside at one of many chic hotels and hit the waters of South Beach. Stroll down Lincoln Road for shopping al fresco and enjoy a world-class meal while people-watching at an outdoor restaurant. Visit the art collection at the Pérez Art Museum Miami next to beautiful Biscayne Bay, and take an afternoon walk through Museum Park. Head over to Wynwood to take in the vibrant street art. Dine at one of the Miami Design District's unique restaurants. Start your day at the iconic Jupiter Inlet Lighthouse and cruise south down to Loggerhead Marinelife Center to check on the sea turtles. Next up: Lunch in West Palm Beach. Ride the trolley through CityPlace and down Clematis Street; with so many local hot spots to choose from, the decision is guaranteed to be difficult, but delicious! Head to Boca Raton for the afternoon, renting bikes to experience the Ocean Boulevard Path, or stroll around Mizner Park. End the day dancing and dining along Atlantic Avenue in Delray Beach. Cultural and art institutions dot the coast of Southeast Florida and brim with one-of-a-kind features, combining eco beauty, rich history and unique works of art. Worth a visit every time you explore Key West, the Ernest Hemingway Home & Museum, Harry S. Truman Little White House and Audubon House & Tropical Gardens are cultural mainstays. Tour the Key West Art & Historical Society's new permanent exhibit at Fort East Martello Museum to view more than 100 sculptures created by the late Key Largo folk artist, Stanley Papio, whose works are acclaimed for their inventiveness and humor. In Islamorada, the Third Thursday Artwalk features artists, vendors and entertainment. As the home of Art Basel Miami Beach, the world's most prominent annual art fair held in December, Miami-Dade County boasts a variety of opportunities to experience local and international art. For highly acclaimed performing arts and Broadway-style shows, head to the Adrienne Arsht Center for the Performing Arts. Stroll down the street-art-clad avenues in the Wynwood Arts District, home to an abundant collection of local galleries as well as Tony Goldman's popular Wynwood Walls. In downtown Miami, waterfront Museum Park boasts the Pérez Art Museum Miami, a highly regarded institution offering a taste of modern architecture and intellectually stimulating exhibits. There's also the Bass Museum of Art in Miami Beach, which reopened in the fall of 2017. For a different, but memorable, experience, visit the Holocaust Memorial in Miami Beach or the Holocaust Documentation & Education Center in Dania Beach. Fort Lauderdale has plenty of museums, galleries and performing arts institutions to visit. Located on bustling Las Olas Boulevard, where shopping and dining abound, the NSU Art Museum of Fort Lauderdale is the perfect place to view more than 7,000 works by artists like Pablo Picasso, George Bellows and Diego Rivera. Children and adults alike love the Young At Art Museum in Davie. The LEED-certified 55,000-square-foot facility inspires, educates and entertains all ages with interactive exhibits, as well as fun art classes and camps. The Cultural Council of Palm Beach County promotes a wide range of theater, dance, art, music and history in what's known as Florida's Cultural Capital. Located in the popular Mizner Park, the Boca Raton Museum of Art houses an array of contemporary and modern art collections. For a unique taste of Japanese arts with the picture-perfect Florida backdrop, visit the Morikami Museum and Japanese Gardens in Delray Beach. Other gardens worthy of exploration include the Ann Norton Sculpture Garden, the Four Arts Botanical Garden and the Mounts Botanical Garden. The Norton Museum of Art in West Palm Beach is one of the most renowned art museums in Florida, featuring acclaimed exhibitions, programs and a permanent collection. And, dating back to 1902, Whitehall, Henry Flagler's Gilded Age estate in Palm Beach, is a National Historic Landmark and open to the public as the Flagler Museum, featuring guided tours, changing exhibits and special programs. For entertaining shows from elegant ballets to Broadway musicals, visit the Kravis Center for the Performing Arts, the Wick Theatre & Costume Playhouse and Palm Beach Dramaworks. For something more intimate, but just as impressive, look up the playbill for the Maltz Jupiter Theater in Jupiter. Southeast Florida offers an abundance of family-friendly attractions, many showcasing the Sunshine State's unique ecosystem and wildlife. In the Florida Keys, the Mel Fisher Maritime Museum in Key West displays gold, silver and treasures recovered from sunken wrecks, while Dolphin Research Center and Turtle Hospital in Marathon invite the whole family to get up close and personal with sea life. Florida Keys Aquarium Encounters, a conservation center also located in Marathon, conducts guided park tours as well as tarpon and shark feedings. 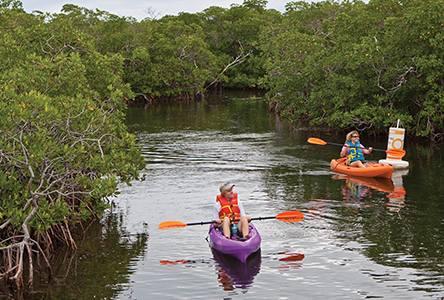 At the Florida Keys History & Discovery Center in Islamorada, enjoy an interactive historical experience through a new permanent model of Indian Key, once the Florida Keys' second largest community outside of Key West only accessible by private boat or kayak. The Florida Everglades is where naturalists and adventurers can spot alligators on airboat tours and learn about the Miccosukee Tribe's unique way of life at the Miccosukee Indian Village. For more exciting animal encounters, visit Zoo Miami just north of Homestead, Monkey Jungle south of the zoo, Jungle Island in downtown Miami and the Miami Seaquarium in Key Biscayne. At the Seaquarium, visitors enjoy the Penguin Isle, a habitat for African penguins, which can be viewed above and below water in a 9,000-gallon pool. Boasting an impressive collection of rare plants and flowers, as well as a sprawling tropical oasis, Fairchild Tropical Botanic Garden hosts special events like the International Mango Festival and International Orchid Festival. The Phillip and Patricia Frost Museum of Science is now open at its new home in Downtown Miami's Museum Park. The 250,000-square-foot facility includes a planetarium, aquarium and science museum. Head to ArtsPark at Young Circle in downtown Hollywood to enjoy a 10-acre interactive park complete with a children's play area. Flamingo Gardens & Wray Botanical Collection offers 60 acres of diverse native plants and trees, a Bird of Prey Center with a free-flight aviary, and the chance to view alligators, flamingos, bobcats and Florida panthers. For a mix of ecology, history and architecture, the Bonnet House Museum & Gardens in Fort Lauderdale is a 36-acre estate preserving a piece of Old Florida charm. While in Fort Lauderdale, hop on board the Jungle Queen for a sightseeing cruise. Then, check out more than 20,000 butterflies from around the globe at Butterfly World in Coconut Creek, the world's largest butterfly park. Visit the Arthur R. Marshall Loxahatchee National Wildlife Refuge in Boynton Beach for guided marsh tours, bird walks, canoe trips and more. In Loxahatchee become part of the herd at Lion Country Safari, a drive-through adventure where you can check out more than 1,000 animals including giraffes, lions, zebras and monkeys. Nearby, the South Florida Science Center and Aquarium features more than 50 hands-on educational exhibits, a state-of-the-art planetarium, a new science laboratory for educational programs and an upgraded theater. At the new Flamingo Experience at the Palm Beach Zoo, visitors ages five and up are welcome to mix and mingle with pink Chilean flamingos. Providing the opportunity to see endangered sea turtles and other marine life up close, the Loggerhead Marinelife Center in Juno Beach is a hospital for injured sea turtles where visitors learn about Florida's marine life and the ecosystem. An on-site playground and a series of educational programs can keep guests entertained for hours, or families can hop across the street to picturesque Juno Beach. A trip to Florida isn't complete without some much-needed beach time. Spend the day swimming, kayaking and snorkeling in crystal-clear water at Bahia Honda State Park, located between the historic Seven Mile Bridge and Big Pine Key in the lower Florida Keys. This stretch of sand has been listed many times among the best beaches in the USA. Home to two sprawling beach parks, Key Biscayne is perfect for oceanfront family picnics. Visit either Crandon Park Beach at the entrance to the island, or Bill Baggs Cape Florida State Park at the island's end. At Bill Baggs, climb the steps of a historic lighthouse (c. 1825) or kayak along the water's edge. Or fish on the seawall of Biscayne Bay where you can spot the remnants of Stiltsville, a collection of historic structures on stilts hovering over the water that dates back to the Prohibition-era rumrunner days. Of course, in Miami, you'll not want to miss the sparkling sands of South Beach. Families love the kid-friendly facilities and mini splash and play area at South Pointe Park Beach, while those who want to be in the "scene" head to the beach along Ocean Drive. Farther north, the beach in Surfside is a favorite among locals because of its laid-back vibe and access to a waterfront walking path. Or check out Oleta River State Park Beach, ideal for kayaking and canoeing. Famous for its bustling beachfront district and an entertainment destination in its own right, Hollywood beach features a variety of sidewalk cafes, boutiques and ice-cream parlors-so go for a dip and then cruise the Broadwalk. Spend the day boating or canoeing at John U. Lloyd Beach State Park in Dania Beach, a popular turtle nesting spot. Drawing spring break crowds for years, Fort Lauderdale Beach runs the length of North Atlantic Boulevard and makes the perfect beach day easy because of its proximity to a variety of restaurants and amusing attractions. Seeking a quiet respite? Enjoy serenity in the shaded picnic areas at Hugh Taylor Birch State Park, which also features monthly mangrove habitat walks. In Boca Raton, the Daggerwing Nature Center features a 3,000-square-foot exhibit hall surrounded by 40 acres of natural area to explore. Check out the panoramic views from the Jupiter Inlet Lighthouse and Museum at Jupiter Beach Park. In Juno Beach, venture out on a wildlife turtle walk then navigate through the rare coastal hammock and natural dune systems, part of Florida's most precious habitat. For hot days and sultry nights, these neighborhoods and hot spots will keep you entertained around the clock, seven days a week. Fans of fine beers, ales, rums and more can enjoy local libations throughout the Keys. For the ultimate barhopping adventure complete with plenty of local music, Duval Street is party central in Key West. At the end of the stretch, Mallory Square is the perfect place to sip a tropical cocktail and watch street performers during the nightly sunset celebration. Tour the Key West First Legal Rum Distillery, located in a former Coca-Cola bottling plant and on the site of a former pre-Prohibition-era bar named Jack's Saloon, and sample free rum. Eat Drink Discover Key West recently launched a new adventure blending food, libations, strolling and sailing. The "Tall & Crawl," a pirate-themed land and sea tour, introduces visitors to the history as well as the present-day beauty and charm of Key West. The tour features a variety of food and rum tastings on land as well as refreshments served on board an 80-foot pirate ship replica, the square-rigged Jolly II Rover. Passengers can help raise the vessel's red sails, participate in a "firing" of the cannons, and view the Key West Historic Seaport, Sunset Key, Christmas Tree Island and Fort Zachary Taylor Historic State Park. Miami has so many popular entertainment districts you could spend weeks here and still not hit every hot spot. Two of the most famous areas are Ocean Drive and Lincoln Road on South Beach. Home of the Art Deco Historic District, renowned nightlife, luxurious hotels and tons of local eateries, both locations offer the ultimate South Beach experience. New in 2018 is the Time Out Market on Drexel Avenue just off Lincoln Road in Miami Beach, which features a curated mix of 17 kitchens, three bars, an art space and a demonstration kitchen. Clubs like LIV at the Fontainebleau and Hyde Beach at SLS South Beach draw the hottest DJs and late-night revelers. Back on Miami's mainland, the Mary Brickell Village near downtown is a popular spot for locals to live, work and play, thanks to a bevy of skyscraper residences, rooftop bars and posh eateries. Both the Wynwood Arts District and Miami Design District have been drawing the cultural elite to hobnob over sophisticated cocktails, luxurious shopping and celebrity-helmed restaurants. Joining other trendy neighborhoods, there's a resurgence of the MiMo Biscayne Boulevard Historic District, where you'll find hip restored hotels and bars from the 1950s. MiMo, short for Miami Modern, describes a design aesthetic unique to Miami that was influenced by American fascination with futurism, jets and space exploration. Lush and tropical Coconut Grove is experiencing a resurgence with new restaurants and boutiques opening up on a regular basis. And in Little Havana, stroll down Calle Ocho to savor a taste of nostalgic Cuban culture where eateries serve authentic pastelitos and Cuban coffee that packs an impressive punch. Not to be overlooked, CityPlace Doral near the Miami International Airport is a recent development with new dining options, shopping venues and residences. If casino-style fun is what you're after, head west toward the Everglades and the Miccosukee Resort & Gaming, which includes non-stop thrills like high-stakes poker, jackpot games and a 1,000-plus-seat bingo hall. Catch year-round horse racing at the Village at Gulfstream Park in Hallandale Beach, home of the Florida Derby. Check out the 800 Vegas-style slot machines, poker tables, open-air mall, international restaurants, bowling alley and art galleries. There's even a children's entertainment center called Cool Corner, which keeps kids hopping. Also, in Hallandale Beach, the Mardi Gras Casino features slots, virtual table games, poker, live entertainment and dining venues. For more round-the-clock casino action and nightlife, head to the Seminole Hard Rock Hotel & Casino in Hollywood, where a 5,500-seat theater draws popular musicians and comedy acts. Check out the Dania Beach Casino and Jai Alai. This more than 60-year-old site of Dania Jai Alai has received a complete US$60-million renovation, including a full casino, slots, 21-table poker room, restaurants and a concert area. Or challenge Lady Luck at the nearby Isle Casino Pompano Park, featuring 1,500 slots, poker tables, six restaurants, harness racing and entertainment. For a unique gaming experience, let the San Gwann, a 400-passenger cruise ship, transport you from the Port of Miami to Resorts World Bimini to enjoy non-stop action in a 10,000-square-foot casino fea-turing popular table games, slot machines, a high-limit gaming salon, a Sports Book and a full indoor-outdoor restaurant. In Southeast Florida, dining and entertainment collide on a variety of popular main drags. Stretching more than two miles along the ocean, Hollywood's Broadwalk features panoramic beach views, a variety of outdoor restaurants and the very popular Margaritaville Beach Resort. Las Olas Boulevard offers plenty of dining options, plus many live entertainment and local music performances every weekend. Mizner Park in Boca Raton is the place to go for shopping, dining and fun. The West Palm Beach Arts & Entertainment District (A&E) unites a fast-growing number of the area's top cultural institutions and burgeoning art scene. This cultural corridor covers a one-mile city radius and encompasses more than 20 distinct and distinguished cultural venues including Palm Beach Dramaworks on Clematis Street and the Society of the Four Arts on the island of Palm Beach. Downtown West Palm Beach is also known for its eclectic mix of restaurants along Clematis Street and in CityPlace, a popular West Palm Beach destination for shopping, dining and entertainment. Probably the most iconic, convertible, wind-in-your-hair drive in Southeast Florida is that along Route 1, a.k.a. the Overseas Highway, from Miami to Key West. But who says a road trip means you have to drive a car? Why not let someone else do the driving and hop aboard Brightline, Florida's new city-to-city passenger train that uses nearly 200 miles of Henry Flagler's existing Florida East Coast Railroad? And since trains hit speeds of 125 miles per hour, you can expect to reach your destination faster than if you drove. Stations in Miami, Fort Lauderdale, West Palm Beach and Orlando are designed to connect with current public transportation options in each city, making it simple to explore those locations. Expect railcars with plush seating, on-board amenities such as Wi-Fi, and competitive pricing compared to other travel options. Dubbed "MiamiCentral," the Miami station is located at NW 1st Avenue, between NW 3rd Street and NW 8th Street. From here, you can walk to AmericanAirlines Arena, Adrienne Arsht Center, PortMiami and Bayfront Park. Take the train up to the Fort Lauderdale station located at NW 2nd Avenue, between Broward Blvd. and NW 4th Street and walk to the Historic District, Museum of Discovery and Science, Riverwalk A&E District and the Broward Center for the Performing Arts. From the West Palm Beach station situated at Evernia Street, between S. Rosemary Avenue and S. Quadrille Blvd., take a stroll to the Clematis District, CityPlace and Centennial Park. With promises of saving 25 percent on travel time compared to existing transportation options, it's no wonder travelers enjoy riding the passenger train. Miami is a shopping mecca and features tons of opportunities to shop 'till you drop. The new Brickell City Centre is anchored by Saks Fifth Avenue and features a variety of luxury, premium and contemporary retailers, including Sephora, Hugo Boss, Tommy Bahama, lululemon, Armani and others, and numerous dining establishments. Nearby, the super-luxe Miami Design District showcases the crème de la crème of high-end fashion, including Burberry, Cartier, Christian Louboutin, Dior, Gucci, Hermès, Louis Vuitton, Prada and Versace. To the south in Wynwood Arts District you'll find more art galleries, retail stores, antique shops and hip bars as well as one of the largest open-air street-art installations in the world. In late 2017, Aventura Mall, Miami's premier fashion destination and America's most visited shopping center, debuted a new three-level, 315,000-square foot expansion wing, featuring dynamic shopping and dining experiences blended with experiential, artistic elements, including a nearly 93-foot-tall sculpture by Belgian artist Carsten Höller, down which visitors can slide. Highlighting the new wing are a two-level Topshop Topman store and the much-anticipated return of Zara to the mall. Perched atop the expansion, a 7,000-plus-square-foot VIP Lounge provides a private ambience and a stylish VIP escape. Anchored by Bloomingdale's, Nordstrom and Macy's, Aventura Mall features more than 300 iconic retailers, including Givenchy, Gucci, Fendi, Burberry, Apple, Michael Kors and other shopper favorites. Other Miami malls you might want to add to your list include Dadeland, The Falls, Shops at Merrick Park and Bal Harbour Shops. Considered among the most fashionable venues in the Sunshine State, Fort Lauderdale's Galleria Mall features brand-name retailers from Apple to Neiman Marcus, dining and a currency exchange kiosk. And don't overlook Las Olas Boulevard with all its trendy boutiques, galleries and restaurants. To score some impressive deals, head to Sawgrass Mills in Sunrise, where you'll find 350-plus stores and the largest outlet shopping destination in the USA. Another great spot for outlet shopping, Palm Beach Outlets features more than 100 stores including brand favorites Saks Fifth Avenue OFF 5TH, Ann Taylor Factory Store, Banana Republic Factory Store, Brooks Brothers Factory Store, J Crew Factory, Tommy Hilfiger and Vera Bradley. Be sure to add Mizner Park Boca Raton, anchored by Lord and Taylor, to your bucket list of shopping malls. The Town Center at Boca Raton is another high-end shopping destination anchored by Nordstrom, Neiman Marcus, Saks Fifth Avenue and Bloomingdale's, while the Gardens Mall in Palm Beach Gardens is a spacious, 1.4-million-square-foot shopping center with more than 150 world-class brand names. Delray Beach's Atlantic Avenue is lined with trendy boutiques and popular restaurants-it's not uncommon to see all ages walking along this main-street style neighborhood hot spot. While you're in town, check out the Delray Marketplace. Don't overlook Southeast Florida's popular flea markets. The gigantic flea market at the Swap Shop in Fort Lauderdale features 2,000 vendors selling brand-name items at bargain prices. Florida shoppers in-the-know also head to the Festival Flea Market Mall, a veritable shopper's paradise in Pompano Beach.